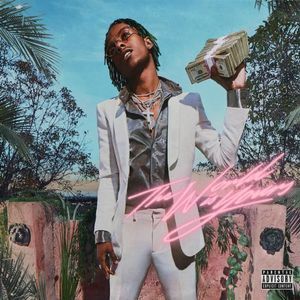 Rich the Kid’s newest album — The World is Yours. Courtesy of Genius. Rich the Kid had an absolutely stellar 2017, with 2018 beginning on promising notes. His two big singles, “New Freezer” and “Plug Walk,” garnered large amounts of praise from both hip-hop fans and the general populace (a feature from Kendrick on the former undoubtedly helped.) However, the March 30th release of Rich’s first album, The World is Yours, seems understated and often times falls short of the meme-worthy persona he has built up in the past year. That’s certainly not to say that it’s terrible — the two early singles still hold their own, and his collaboration with Future, “No Question,” has one of the catchiest hooks of the year so far: “It’s a blessing, I was broke but now I’m flexing.” Another catchy banger, “Too Gone,” features a crooning Khalid lamenting a missed opportunity for romance in a boozy haze. Rich does alright on his verses, but Khalid is the standout player. Like a sixth man off the bench, Rich taps Lil’ Wayne for a surprising feature on “End of Discussion.” The track itself holds its own, layered in atmospheric synths and a simple beat, but it is actually Rich the Kid who shines here- Wayne’s verse comes on quick and feels archaic in the milieu of modern rap. The final track worth noting is the promotional single “Early Morning Trappin,” enveloped in an erratic, but not overbearing, beat, and supplemented by an incredible Trippie Redd feature. His scratchy autotune melodies command replay after replay, and Rich (who finally shows some hustle) blasts out energetic, if incomprehensible, flex lines. The real problem with the rest of the album lies in Rich’s uninspired flow. Like his contemporary Famous Dex, Rich the Kid sometimes sounds asleep at the mic, slurring his words, seemingly apprehensive to really tear into a beat. Future and Young Thug get accused of “mumbling” incessantly, but they are able to turn their slurs on and off, adapting to the production environment to great effect. Rich is lacking in versatility. He does have youth on his side, though, and ample time to improve. Otherwise, Chris Brown’s verse is fun on “Drippin,” but it’s just not enough to make up for the uninspired instrumental, and Quavo and Offset do their usual shtick on “Lost It.” The rest of the album feels like a collection of throwaway tracks– “Dead Friends” is especially disappointing, hearing Rich fumble his way through a gorgeous instrumental.